There are a lot of “Best SAT Prep Books” lists out there. Most of them aren’t all that great – so we’ve built a better list. We’ve looked through most of the books available today. And we’ve written a brief summary for our favorite picks. Your SAT score is important. And as you’ll be spending a good amount of time studying, it’s critical that you get the right advice. For a quick overview, below is our list of the best SAT prep books. For more information, scroll below. Your SAT score is a very important factor on your path to higher education. And if you’re aiming for a top score chances are you’ll be spending a large amount of time studying. But what you study with is tremendously important. Follow a weak study routine or practice with the wrong testing material and your score will suffer. That’s why it’s important to find the right SAT prep material. Since you’re looking for the best SAT prep books, chances are you’ve already decided that a prep course isn’t for you. And that’s fine. We firmly believe that a solid prep book partnered with consistent and dedicated preparation yields to strong scores. So why should you trust our opinion? We explain what makes each book great, and what each book’s flaws are. Content is king. For our reviews we look through each book’s review material, gauge the practice question quality, and deeply assess testing strategies within each book. We evaluate which books are best for training on specific sections of the SAT. Everyone’s different and we all have our own weaknesses. Knowing who each book is designed for makes it easier to match to your own abilities. This guide is created first and foremost for students that are motivated to work towards getting a high score on the SAT. Working through these books will take time and effort. You’ll have to work through hundreds of practice questions before things begin to stick. Practice makes perfect for the SAT, remember that. If you’re willing to put the man hour into studying then buying a prep book will be the easiest step in your SAT preparations. Just understand that if you’re not willing to put time into studying, your choice of book does not matter. The best SAT prep book will not get you a high score, that’s on you. Best: these are books that everyone should use or strongly considering working with, regardless of skill level. They offer comprehensive review or have the highest quality practice questions available. Good: good all around books but not the best – these are solid options to use for supplementary practice. They’re typically less expensive too, making them a better picks for those on a tight budget. Extra Practice: supplementary books intended for students who are focused on obtaining an exceptionally high score by mastering difficult SAT questions. In most cases, these should only be used after completing a more thorough prep book. Subject Specific: the best books to strengthen your individual reading, math, or writing section abilities. If you’re in the United States, below are your SAT Testing Dates for 2017-2018. For more information, head to the CollegeBoard website. No list can ignore the Official SAT Study Guide. It’s the most authoritative guide on the SAT available today as it’s written by the SAT test makers. That means these questions are mirror copies of what you can expect on your test day. Included are 8 official full length practice tests. Each test takes about 4 hours to complete and 2-3 hours to review. The best way to get strong scores on the SAT is to practice, practice, and practice. And that’s exactly what this study guide offers – plenty of practice opportunity. Answers are available for each question but the guide doesn’t include any instructional material. So if you’re weak at algebra and need more review, it might be smart to supplement this guide with another book. With that said, this is a must have SAT prep book for all test takers. The official practice tests are not only excellent for practice. They also reliably predict your SAT score. As part of the College Board’s commitment to transparency, all four practice tests are now available for free on the College Board’s website. But The Official SAT Study Guide is the only place to find them in print along with over 300 pages of additional instruction, guidance, and test information. Kaplan, a leader in test prep, brings SAT test takers a guide to feel more confident about the SAT. The Prep Plus is Kaplan’s flagship guide. It’s easy to digest and it offers a broad range of content review. There’s coverage on the SAT basics. There are more than 1,400 practice questions with detailed explanations to work though. And there are five full length practice tests included. One is diagnostic, two are in the book, and three test are accessible online. Kaplan does an excellent job at being part of the 21st century. There’s a mobile version of the book. And an online companion site that includes a variety of videos and quizzes. Kaplan believes in this product so much that they guarantee it’ll improve your score. If it doesn’t, you can receive a full refund. Princeton Review’s “Cracking” series is one of the best test prep material on the market for numerous standardized tests. This book focuses on the SAT and it offers exquisite techniques and strategies for each test section. Fictitious character, Joe Bloggs, an average student with average grades is used to illustrate how SAT questions are designed to trick test takers into picking the wrong answers and how to best avoid them. Cracking the SAT includes seven practice tests (4 in the book, 3 online) with answers and explanations. We really like how Princeton Review approaches SAT studying and are sure it’ll raise SAT scores for its readers. But that said, this isn’t a book designed to master the SAT. It’s one that targets average students into getting above average SAT scores. For more information on SAT scoring and percentiles check out Collegeboard’s Understand SAT Scores pamphlet. Barron’s a well trusted leader in standardized test guides. Its New SAT book offers a good mix of SAT prep. 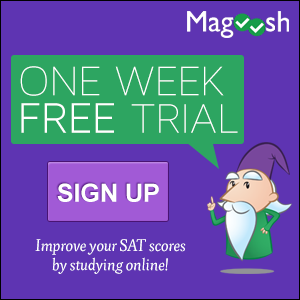 There’s content review, test taking techniques, and targeted strategies for specific SAT sections. The book’s arranged in a simple manner. It provides the necessary guidance needed to build a solid foundation for the SAT. Included are five full length practice tests with in depth explanations to match. You’ll also gain access to Barron’s Master Word List. A vocabulary list compiled of over 2,100 words used on the new SAT. The best words to describe this text are reliable and thorough. The book doesn’t change the SAT studying model nor does it offer any notable bells or whistles. But within its 1,050 pages it provides valuable review and practice. McGraw-Hill has completely revamped their SAT prep line for 2017. This is a well written and thorough SAT guide with a plenty of practice opportunity. There are 4 full length practice tests with explanations all in the print. We found the practice problems to be of good quality. Close to the official questions by the CollegeBoard. Many of the testing strategies and hints (such as when using a calculator) are quite useful. And an included test planner app helps you build a schedule to organize your SAT study time and goals. It’s an excellent add-on, especially when students find it difficult to self motivate. Content wise, the material is on part with Kaplan and The Princeton Review. Coverage is good and the answer explanations are sufficient. The test planner app is what sets this package apart though. Keeping a study schedule with daily/weekly assignments ensures you progress in the right direction. Ivy Global is a private tutoring company. All their SAT instructors have scored in the 99th percentile. The team released an SAT prep book built around their own private tutoring structure. It’s quite a compelling book. There are only 4 official SAT practice tests released by the College Board. Those practice tests should be you’re first go to. But 4 practice tests isn’t enough for full preparation. Ivy Global’s practice questions are the closest we’ve ever seen to the official questions. That’s a big deal. The book features three full length practice tests. There are also plenty of drill questions, strategies, and tips for you to work through. One caveat here, is that the answer explanations are only found online. So sitting in front of a computer will be necessary at times. Kaplan put together over 1,200 practice problems (8 full length practice tests) for you to work on. There are explanations and step by step applications for all the questions to ensure you understand the tested concepts. The question style is formatted in a similar fashion to the official SAT test. We found some of the questions to be easier than the official exam questions. But the sheer number of questions to work through make this understandable. There are plenty of practice opportunities to begin mastering specific category questions. And that makes this an excellent practice book. If you’re looking for a prep book that’s filled with practice questions then this is it. Princeton Review compiled over 500 questions built around the latest SAT. This includes multi-step problems, passage based grammar questions, and extended thinking grid ins. The question quality is good. Strong enough to help you hone the higher level math and critical reading skills needed. Each practice question is accompanied with a detailed answer explanation. We’ll add that Princeton Review did a stellar job with these step-by-step solutions. All things considered, this is a great book to pick up if you’re looking for extra practice. But, we don’t recommend it as an all-in-one solution. There are no practice tests to work with and less topic review than one would expect. Take this book at its face value – these are practice questions only. Find yourself struggling with math? Kaplan’s Math Workbook provides excellent math review and plenty of practice opportunity. Giving you an opportunity to expose your weaknesses and improve on them. The content review goes over every math concept tested on the SAT. This ranges from basic Algebra to more advanced trigonometry. There are 16 practice sets and over 250 practice questions to work on. Kaplan practice questions are not the most realistic. But,they do a good job at reinforcing the math concepts reviewed. As with other Kaplan books, the material is well organized which makes it easy to work through. The SAT reading section is the most difficult section to improve. It uses logical reasoning skills that are not easy to master. You’re probably thinking now, how hard is the SAT reading section? It depends on how much you read! But the Critical Reader does a great job at breaking down the reading section. It goes over key patterns, testing traps, and explores the use of helpful strategies. Every reading question type on the SAT is reviewed and dissected here. There are also plenty of practice opportunities. We found the practice questions are of excellent quality and mimic those on the SAT. Although the book is on the pricier side, it’s currently the best SAT reading book available. The best SAT writing focused book out today. To tackle the SAT writing component you need to understand grammar rules and how they appear on the exam. This book does a fantastic job at reviewing all the SAT grammar rules you need to know. The book cross references the official College Board Guide and several Khan Academy tests. Unfortunately, there’s a companion book dedicated to practice questions, the SAT Grammar Workbook. It would have been nice to include more practice question into this book. That said, the book does provide some practice questions to drill yourself on. Use this book for its comprehensive grammar coverage. Practice the learned material against the official practice tests or an extra practice book. CliffsNotes Math Review has dedicated sections to every type of math problem you can encounter on the SAT and more. The explanations are easily understandable and the book structure is very well thought out. You’re able to take a diagnostic test which enables you to identify your weaker areas. Study smarter by knowing what to dedicate your time towards. Although this book isn’t dedicated to only the SAT, it’s excellent for math review. It has many applications and can come in handy if you plan on taking other standardized tests in your future like the ACT, GED, or ASVAB exams. If you want to learn a little more about the SAT, check out our about the SAT page. Need some extra practice? We’ve compiled a list of free SAT practice tests to work on.